Curfews are a misguided use of police time and wrong to kids and parents. They do not target the time period when juvenile crime is highest, which is in the afternoon. They do not reduce juvenile crime. What they do is limit lawful behaviors, hassle parents, further stigmatize youth, and distract from real solutions to youth problems. 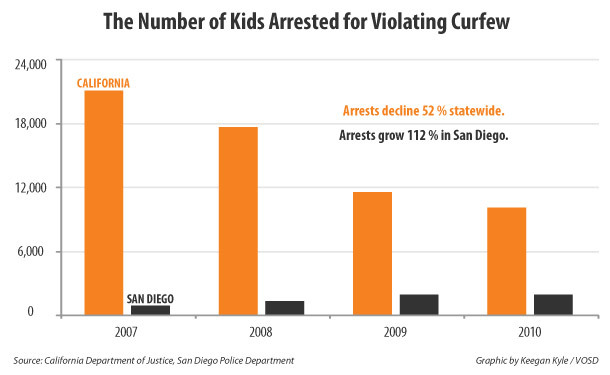 The City of San Diego’s 50 year old juvenile curfew was overturned by the 9th Circuit Court of Appeals in 1997, thanks to a lawsuit by the ACLU of San Diego & Imperial Counties. It was deemed vague, restrictive of young people’s free speech rights, and unduly interfering with parents’ fundamental right to rear their children. Michael Males of the Center for Juvenile and Criminal Justice, an expert on curfew sweeps, says that connecting kids and families with services is commendable – if they need it. Yet curfew sweeps are like random checkpoints, he says, where everyone gets arrested, not just people who are doing something wrong. Sweeps push kids into feeling victimized by the police, and push communities into believing their kids are being criminalized, Males said. His perception was echoed at a recent community meeting where organizers declared that San Diego police conduct sweeps only in divisions where minorities are the dominant group. City Heights, where the curfew sweeps occur, is one of the most ethnically diverse neighborhoods in the nation. About 54 percent of the population is Hispanic, 16 percent is Asian (Vietnamese account for 9.9 percent of the population), and 16 percent are African or African American, according to American Community Survey statistics. Just 20 percent of the residents are white, according to the American Community Survey of 2010. About half the 26,200 households in City Heights have incomes of under $35,000, and the families are larger and more likely to be single parent households, according to U.S. Census statistics. And the area has among the highest percentage of people under 18 in California: where the statewide average is about 28 percent, nearly 33 percent of City Heights residents are under 18. More than 70 percent of the households have limited English proficiency, according to a California Endowment public health survey. According to the National Council on Crime and Delinquency (NCCD), curfew enforcement is often ineffective and unnecessarily funnels large numbers of non delinquent youth into a criminal justice system that is already inundated with alleged offenders. In addition, some opponents cite a lack of evidence supporting the efficacy of curfew legislation. 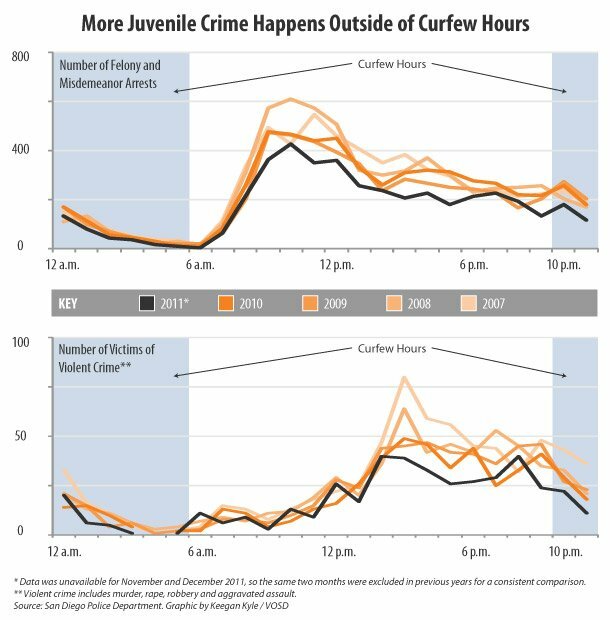 According to the literature review conducted by Ruefle and Reynolds, little or no recent evidence indicates that curfew initiatives have an effect on juvenile crime, nor has research addressed the impact of curfews and their enforcement on the criminal justice system as a whole. The American Civil Liberties Union (ACLU), argues that curfew measures violate the constitutional rights of children and parents. Legal challenges to the constitutionality of curfew laws are most often based on the 1st, 4th, 9th, and 14th amendments to the U.S. Constitution, according to a recent report by OJJDP. Opponents of curfew ordinances are concerned with the restrictive nature of these laws and the limitations on a youth’s first amendment right to free speech and association. Others argue that curfews give law enforcement excessive power to detain children without probable cause and subject them to police questioning in violation of the fourth amendment’s guarantees against unreasonable search and seizure. Additional legal challenges to curfew laws have been based on the ninth amendment, which has been interpreted as providing a privacy right applicable to parents rearing children. Yet other critics argue that curfews violate the equal protection clause of the 14th amendment by establishing a suspect classification based solely on the age of a group of individuals.